To Elvis fans Johnny Cash was the fourth member of the now famous Million Dollar Quartet Before Walk The Line Johnny Cash was famous for his bass vocals, country music Here’s what Elvis had to say about Johnny Cash. The session pinpoints with unabashed accuracy where rock-n-roll got its energy. It proves that it wasn’t simply something that exploded on an unsuspecting world one day in 1955. The roots were clearly born and deeply rooted in country & gospel music. As Elvis, Perkins & Lewis mixed their unique styles; each performer’s gifts emerge with the rarest musical qualities. 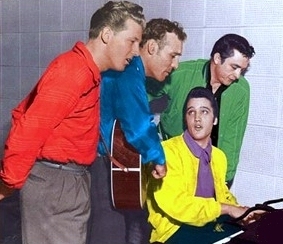 Elvis headed for the piano and did a Fats Domino impersonation of Blueberry Hill. The joint was really rocking before we got through. Elvis on Jerry Lee. “That boy can go,” he said. “I think he has a great future ahead of him.” Why does Elvis music still sell? Are his fans re-discovering the multi-faceted singer? 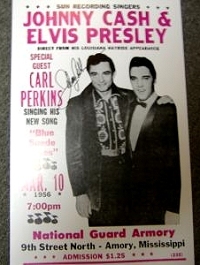 Like many fans, I did not discover Elvis’ gospel music until after his death, when I could not get enough of his music. Why is 50’s music still so popular with radio stations? In content todays music and lyrics is angry and aggressive whereas 50’s music talks of hope – a story we all want to hear. He was a poor sharecropper’s son from Kingsland, Arkansas, who sang to himself while picking cotton in the fields — then later sang to millions through recordings, concerts and his late 1960s TV variety show. He became a country music statesman who found a home with rap-rock producer Rick Rubin’s American Recordings. Cash died of complications from diabetes at Baptist Hospital in Nashville, Tennessee, hospital spokeswoman Nicole Bates said. He had just been released Tuesday after entering the hospital August 28 with an undisclosed stomach ailment. He returned to the hospital Thursday. Cash’s wife of 35 years, June Carter Cash, died May 15. He has recorded more than 1,500 songs and they can be found on about 500 albums, counting only American and European releases. More of his albums (45) remain in print today than most artists ever make. He is the youngest person ever chosen for the Country Music Hall of Fame and the only performer ever selected for the Country and Rock Music Hall of Fame, until 1998, when Elvis Presley was inducted into the Country Music Hall of Fame. He has placed 48 singles on the Billboard Hot 100 Pop charts, about the same number as the Rolling Stones and the Beach Boys.